#54. 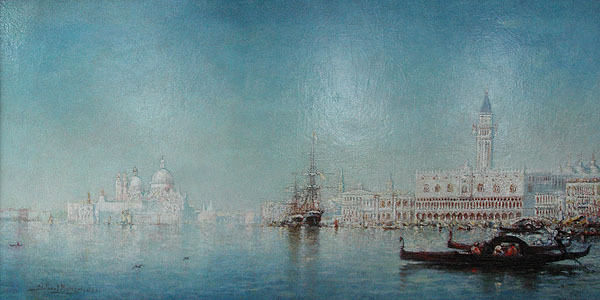 Venetian Scene. 22 x 44, oil. "Gilbert Munger 1883" lower left. From the Lyman A. Mills estate, sold for $95 at Parke-Bernet Galleries, New York, sale 801 held in October 1946, lot 118 (not illustrated; date reported as 1893). 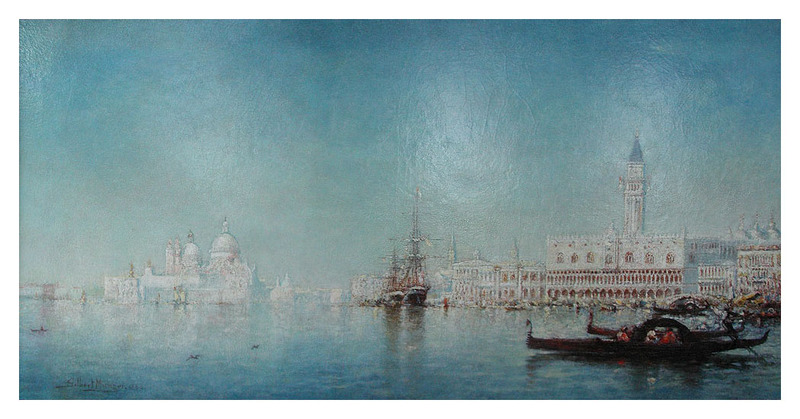 From that catalog: "Blue waters of the Lagoon, with gondolas at the right, and square-rigged vessels moored near quays, before a view of the Doge's Palace and the high tower of the Campanile bordering the entrance to the Grand Canal, with the domes of the Salute at the left. (Mills estate)" From 1946 to 2004 the location of the painting was unknown. Then what is likely the same work was sold for $1,400 + 20% at the Stamford Auction CT "Treasure Tuesday" sale of 11 May 2004 as lot 42. IAP 61504236. Munger, who we know to have been in Venice in September of 1882 (see letter printed on 1882 Oct 22 in the Archives) and who most often records what he observes, placed the comet in the sky of this painting. It is the left pointing faint white 'V' in the upper right sky. The image is from the current owner's digital photo.